Learn one hundred everyday words with this Japanese/English vocabulary book, delightfully illustrated by Stephen Cartwright. Each picture has its name written in simple Japanese “kana” signs with a pronunciation guide and English translation. 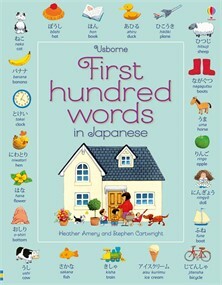 Readers can hear the words read aloud by a native Japanese speaker at the Usborne Quicklinks website.